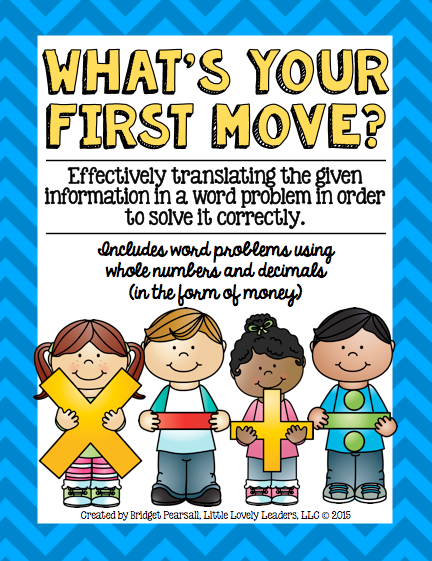 Word Problems: What's Your First Move? Don't we LOVE them?! ...psych! I realized this year that my students are having trouble with word problems....wait..let me elaborate. 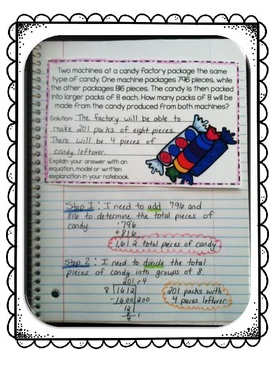 They are doing well with word problems with each section that I teach: adding decimals, dividing whole numbers, etc. However, I realized that the students knew what to do because they used their common sense - "If we are learning dividing decimals right now, then on our test, I will need to divide when I come across a word problem." Hm....What about when my students are faced with their standardized test and they will need to figure out which basic operation they will have to use for each word problem on their own? What will happen then? 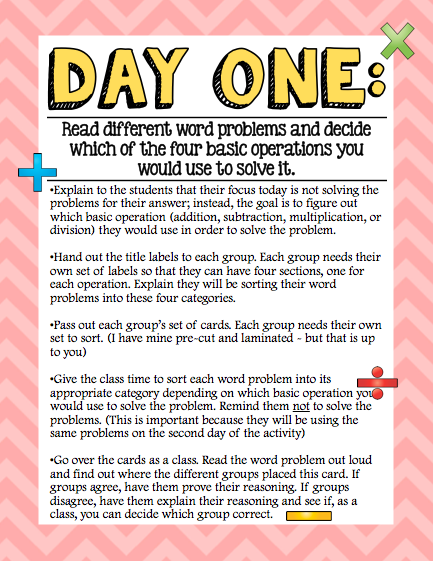 ...students will not focus on solving word problems, but instead they will work on figuring out which basic operation they need to use in order to move onto solving the problem. In other words, what will our first step be if we were to solve the problem? Below is a pair of my students working on this activity. They are reading the 20 cards and then placing them in the addition, subtraction, multiplication, or division section depending on what their first step will be when solving the problem. 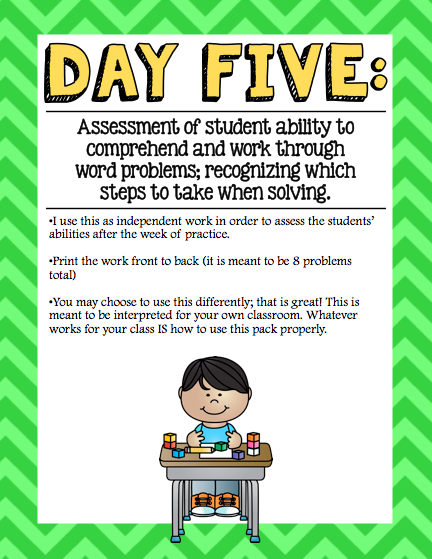 ...students will use any of the five printable worksheets given, OR the task cards used in day one, to solve the word problems we read on the first day. Now, they need to read the word problem, check off which basic operation they will use, and then solve it. 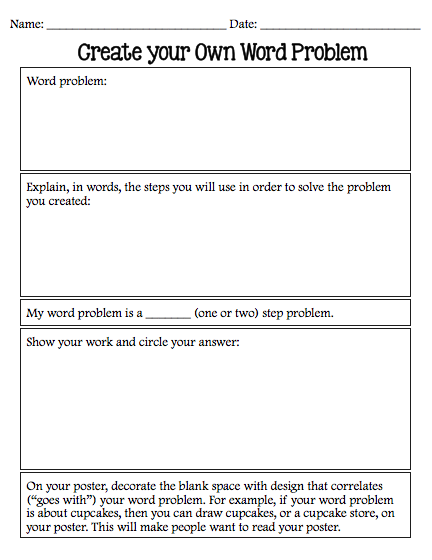 An example of the printable worksheet is seen below. 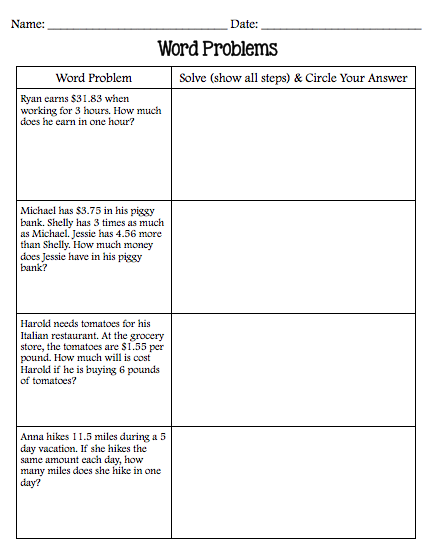 ...students will be introduced to two-step word problems. 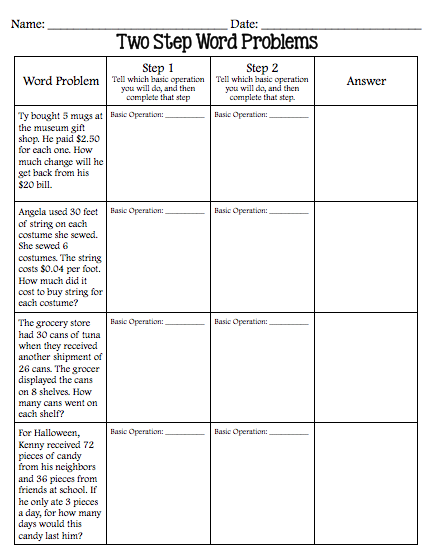 These word problems require two steps, or two different basic operations, to solve. 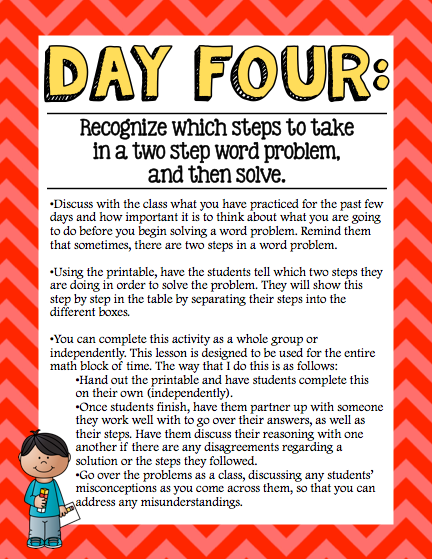 Students will need to recognize these, the steps they will use to solve it, and the order in which they need to solve it. 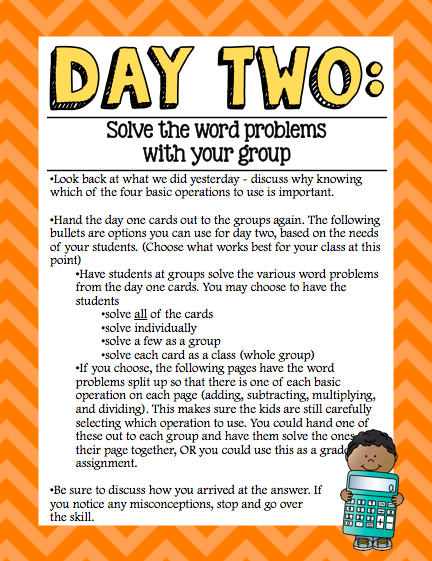 A sample of the task cards for day three are shown below. 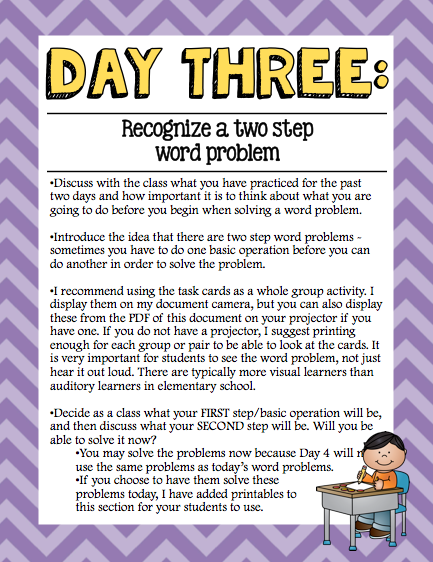 ...students will not only recognize the two step word problems, but they will solve them. The printable worksheet requires them to solve their problem in different boxes in order to have the students organize their steps. This will really help you, as their teacher, find where their mistakes or misconceptions are, if any. ...you will assess your students! Yay! Find out how they are doing now that they have practiced word problems. 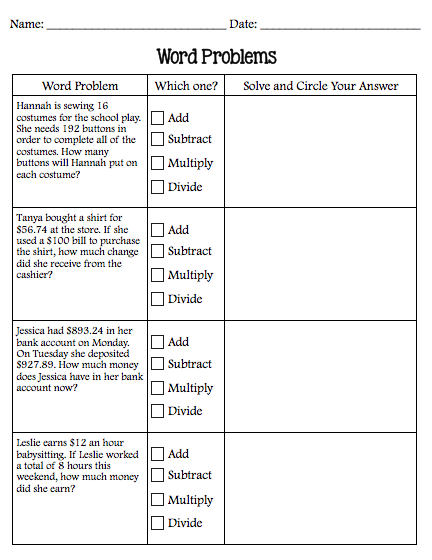 The assessment mixes up the word problems so that they are using different basic operations each time they solve, and in no particular order. This also mixes one and two step word problems. 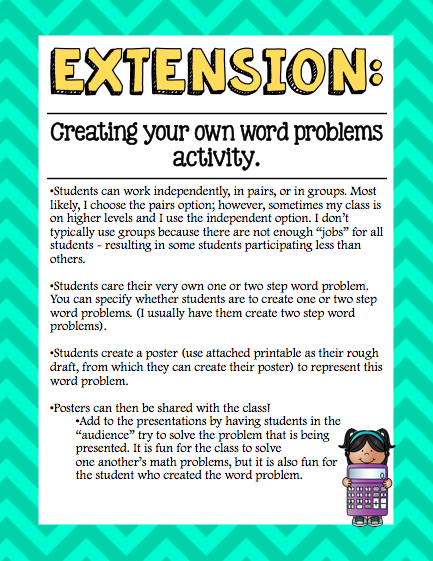 Students can create their own word problem...alone, with a partner, or with a group! They will use the page you see below to set up their work, and then they will create a poster! :) This is one of my favorite projects! Here is the link if you would like to see more about this packet! Isn't it great when you buy something on Teachers Pay Teachers and then use it often!? Getting the most bang for your buck is always a great thing! However, some of these amazing sellers that you are used to buying from, have some SUPER AWESOME freebies! 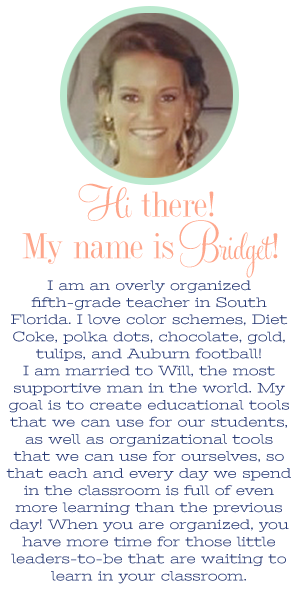 I am always shocked by some of the amazing things I find for free on TpT! 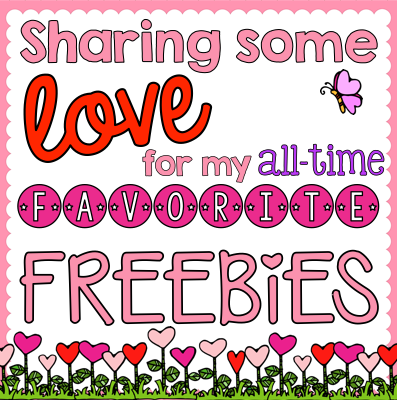 I want to share some love for a few of my favorite freebies that I have downloaded in the past, and find myself using all of the time! I am a little early for Valentine's Day...but maybe I can mention something you will also find useful! Let's start with a huge THANK YOU to these sellers for having such wonderful items like these up in their store for FREE! 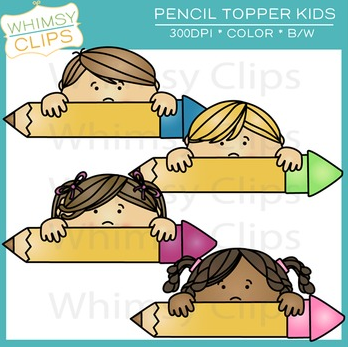 These freebies are great because the art can go with anything that you do in your classroom. 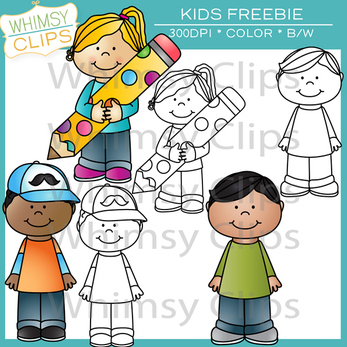 These clip art kids are great on worksheets or letters you send home to parents. I use these a lot for little personal things in the classroom. Write the room cards are great for all grades! All of our students have one particular thing in common: they love getting up out of their seats! 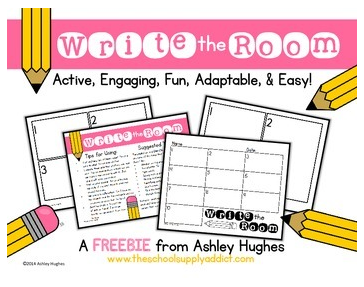 This pack is great because it is ready for you to create a write the room activity whenever you need one! Whether you have all day or 5 minutes to create the activity, this pack is ready for you! I love EVERYTHING Ashley Hughes makes...but this happens to be my "most commonly used" of all of the free items I have from her! Love it! Figurative language is something I teach throughout the year, but it is not always easy to find stories that contain figurative language. 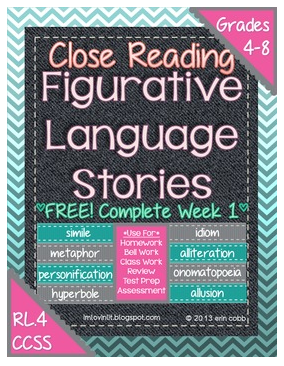 This pack is great because if I feel like I need a little something to reinforce the figurative language skill in my class, I can just do these with my students. I can pull them up on my big screen and do them with the kids at any moment. I like this because I don't necessarily need to have copies made for each student. If I do plan ahead and have copies made, then I can use these for morning work, as assessment for my lesson, or as an early finishers assignment. This is my newest freebie! I just stumbled upon this recently, but I am SUPER excited to start using it! 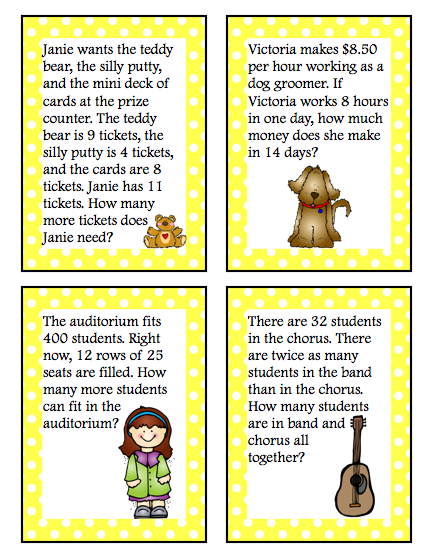 My students need all of the word problem practice they can get - and I am having a hard time thinking of so many word problems! Haha! It gets tough after a while! 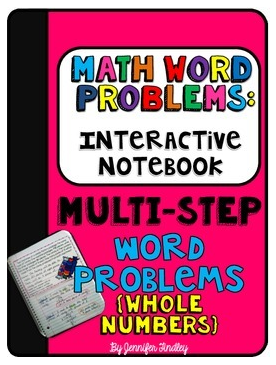 This resource is great, and I absolutely LOVE how she uses it in her classroom. She has the students glue the problem into their math notebooks and answer it in there. I love this idea! Thanks Jennifer! I have two favorites ;) I use these sets of posters every single day! 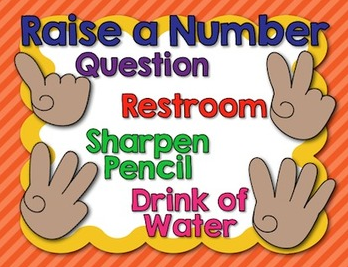 One set it great for classroom management - my students use a 1, 2, 3, or 4 to tell me what they need without me having to ask them what their question is (example, if they hold up two fingers, I know they have to use the restroom). This is helpful for management and flow of the classroom. The other set is a set of math posters. 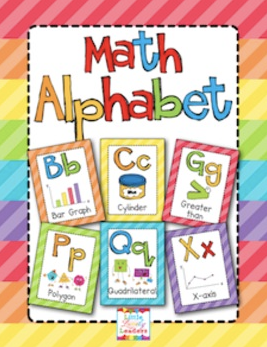 I love these because, instead of a plain set of ABC posters, these are math related in content! I also have these for sale in a Science format.